Tired of the daily grind of lather, shave, rinse, repeat? Put down the blades and take up a great cause during the month of November. We’re issuing a challenge -- Let Your Humankindness Grow instead! The premise is simple: Don’t shave between Nov. 1 and Nov. 30 and make a donation below in support of men’s health programs at the University of Arizona Cancer Center at Dignity Health St. Joseph’s. Challenge your friends and get creative. You can share your progress with us on social media using #GrowHumankindness. If you're an employee at St. Joseph's you can also donate via payroll deduction or PTO donation. Log into the Dignity Health Employee Self Service application. Select “Employee Giving” on the left side of the page then select “ESS Employee Giving” on the left side of the next page. Make your donation selections and select "St. Joseph's Foundation (Phoenix)." On the following page please enter "Let Your Humankindness Grow" in the "purpose/restrictions" field. Thank You to the Dbacks for ongoing support! 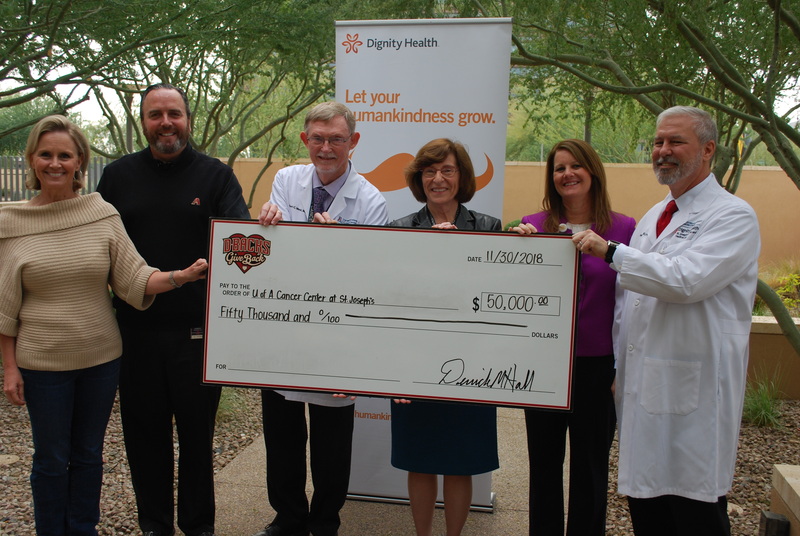 The Arizona Diamondbacks Foundation presented a check of $50,000 to St. Joseph's at the Great Shave Off in November 2018, supporting men's cancer care. The University of Arizona Cancer Center at St. Joseph's offers a variety of programs and services focused on keeping men healthy.